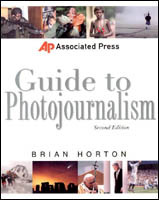 Notes | Written by noted AP photographer and photo editor Brian Horton, this is an insider's manual to one of the most glamorous and exciting media professions. Emphasizing the creative process behind the photojournalist's art, Brian Horton draws upon his three decades of experience, as well as the experiences of other award-winning photojournalists, to instruct readers in the secrets of snapping memorable news photos every time. With the help of more than 100 photographs from the AP archives, he analyzes what constitutes successful news photos of every type, including portraits, tableaux, sports shots, battlefield scenes, and more, as well as offering tips on how to develop a style of your own. Comments | [03/26/07] I decided to pick this one up for vacation reading and so far I am enjoying it! Glad there is a "Educate Yourself" section on SS! I personally feel that it is an insightful read and is teaching me a couple of things I wish the Journalism Dept. could have given me first hand. Comments | [05/31/03] I second all previous comments. A great book that puts everything together in a concise, organized way. Good read for beginners in the field. Comments | [05/28/03] If your looking for advice from top professionals, read this book. Alot of advice, ideas and help. I will be picking up and re-reading alot over the next few months. Comments | [03/01/03] I just wanted to say Thank you all for recomending this book. I am in the process of reading it at the moment and I am learning a great deal from what is written ,it's helping Me a great deal here at My position with the newspaper I work for . It's helped Me to relay a better out point of veiw to the readers of our local paper. Comments | [12/30/02] I just picked this book up at a Barnes and Noble. I purused it and then bought it. It is not only a great book for young photographers beginning their careers, but an insightful look at professional photojournalism with plenty of tips that even old pros can use. The book is also inspirational for those of us who continually strive to do a better job. Comments | [12/26/02] I borrowed this book from the Managing Editor of The Chronicle last year and he had to track me down before I gave it back to him. It is a great book for the beginning photographer. I would suggest it to anybody interested in photojournalism. Comments | [12/22/02] Better and more important information than the Kobre book. Worth it just to read the stories by many AP staffers you've only read the bylines of ... Students: GET THIS BOOK. Bert "The Big Kahuna"
Comments | [11/24/02] I just read my copy the other day for about the 398,873 time. A great book to keep you fresh and inspired. With Ohio State heading to Tempe, AZ I know that will be carrying on ALL essential gear when I leave to cover the game after reading the story about David Longstreath's coverage of a plane crash that occured as he was waiting for his flight. Comments | [10/04/02] This book is great for anyone just looking for a new way of looking at the jobs we do everyday working at anypaper anywhere in the world. It is full of ideas, and commments from working pros. Lots of tips on how to shoot everything from major floods down to finding feature pics...a great read when you just need that little "kick"! Comments | [10/03/02] This book is a great resource on real-life photojournalism. I read the first edition when I was in college and learned alot from it. This book offers terrific insight into the life of big-time working AP photographers like Eric Risberg. Learn how to shoot everything from picture stories to baseball games- this book is a keeper.